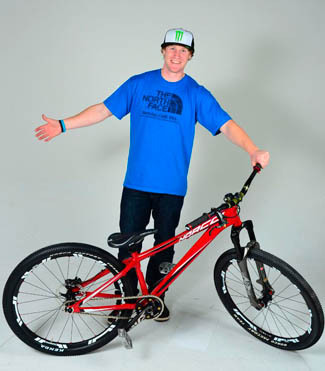 Rossland, BC, native Mike Hopkins has signed on with Norco Bicycles for 2012 as an independent rider. For the upcoming riding year, Mike will be aboard the Norco Aurum, Sight, Shinobi, Rampage and custom slopestyle frames as he accomplishes his season goals. Mike comes to the team with a strong list of accomplishments, boasting major video spots in Life Cycles, From the Inside Out, Red Bull Rampage and many other videos. Mike has also been recently featured in several print publications and websites internationally. His dedication and passion for the sport have made him one of the most recognizable athletes in mountain biking. Looking forward at 2012, Mike has even grander plans than in years past. This coming season he will be working on major video projects with Sherpa Cinema, Second Base Films and Absolute Zero. Mike is also planning to participate in the 2012 Deep Summer Photo Challenge and the Redbull Rampage. With his Norco bike Mike will work closely with Norco and his other sponsors: Monster Energy, The North Face and others on many of these key projects. Mike comments, "I am excited to work with a company like Norco that has built its brand around bikes engineered for my style of riding. The opportunity to work with Norco's engineers on new design ideas and platforms is very exciting. Watching Gravity Tune come out of Norco in conjunction with the Dirt Norco Race Team illustrates Norco's dedication to its riders and product development." "We couldn't be happier about adding a top-tier Big Mountain rider such as Mike Hopkins to our list of supported riders. The level of skill, professionalism and exposure that he brings with him will do great things for Norco and I know that we can offer Mike the opportunity to push his success and career even further," said Pete Stace-Smith - Norco Marketing Manager. Mike brings with him a list of personal sponsors including Monster Energy, The North Face, Marzocchi, Shimano, 661, Gravity and Smith Optics.